First Appearance: Journey Into Mystery (vol. 1) #83 (Aug. 1962): "The Stone Men from Saturn!" 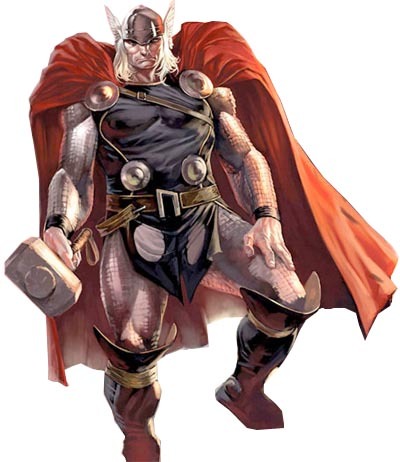 Thor is best known as a Marvel Comics character. 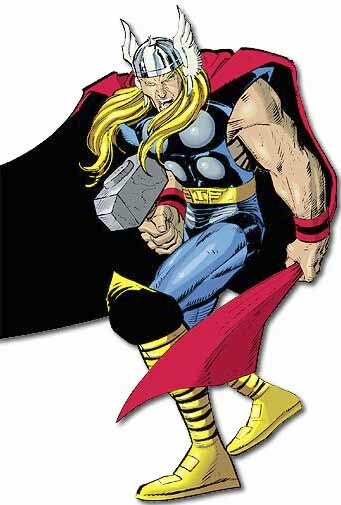 He might best be said to have been "adapted" by Marvel comics creators Stan Lee, Larry Liebe and Jack Kirby, rather than "created" by them, because the character was already in existence for centuries as a member of the traditional Norse/Teutonic pantheon. 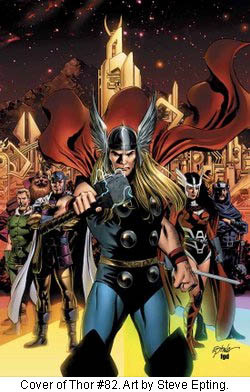 Because the mythological Thor is a public domain character and does not belong only to Marvel Comics, he has appeared in comics from other publishers as well. For example, he was one of many minor deities in Neil Gaiman's Sandman. Also, he appeared in DC Special #4: Thirteen Shock Ending Stories (Sep. 1969). 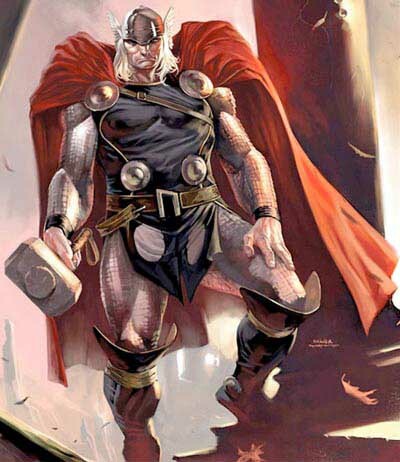 Thor is occasionally categorized as a "thunder god", alongside other thunder gods, including the Sioux god Haokah. Thor's hammer Mjolnir is one of the world's most famous weapons. The hammer was created by the dwarfs Etri and Brokk and then enchanted by Odin himself. Before any other Asgardian characters or elements of Asgardian myth, Mjolnir appeared first in Marvel's Thor mythos, right alongside Thor himself, in Journey Into Mystery #83 (Aug. 1962). Years after the introduction of Mjolnir, Thor (vol. 2) #80 revealed how the "Mjolnir Forge" was used in the creation of Thor's mighty hammer. This forge was cast into the Gunin Gap by Brok, Buri and Etri after they used it to create Mjolnir. But Loki retrieved the Mjolnir Forge and gave it to Odin's enemy Surtur. Surtur used the forge to create powerful hammers for a number of Asgard's enemies. Fury put down his pen and squeezed the bridge of his nose. "Okay," he said with his eyes closed. "I get it. If I have to raise my right hand and swear that I believe you're the Norse god of thunder just to get you to leave, I'll do it." He raised his right hand, looking down at his desk. Ten seconds or so later, he looked up. "You're not gone." "You're not very convincing," Thor said. "Neither are you, Mister Son of Odin, or Wotan, or whatever we're supposed to call him. I don't believe in gods--any of them--and until you bring Jesus Christ himself in to walk across the Upper Bay from Battery Park to here, that isn't going to change. Far as I'm concerned, you're a garden-variety anti-globalization wacko who got hold of some tech that nobody can reverse-engineer. Doesn't make you anything special." Thor had started smiling at "Wotan," and couldn't stop. "Quite a speech, General Fury." "You provoke me," Fury said. "Well. Let me provoke you to pay attention." BELOW: Elise Erickson writes to Thor: "Every night I say a prayer to you...": As demonstrated by her prayers to him, Elise Erickson's relationship to Thor at this point must certainly be characterized as sincere worship. Elise is an unusual character because she was definitely not raised to worship Thor or have Norse/Teutonic pagan beliefs. (In fact, her father actively discouraged this.) Elise appears to have become a Thor worshiper completely on her own, acting counter to cultural and family expectations. 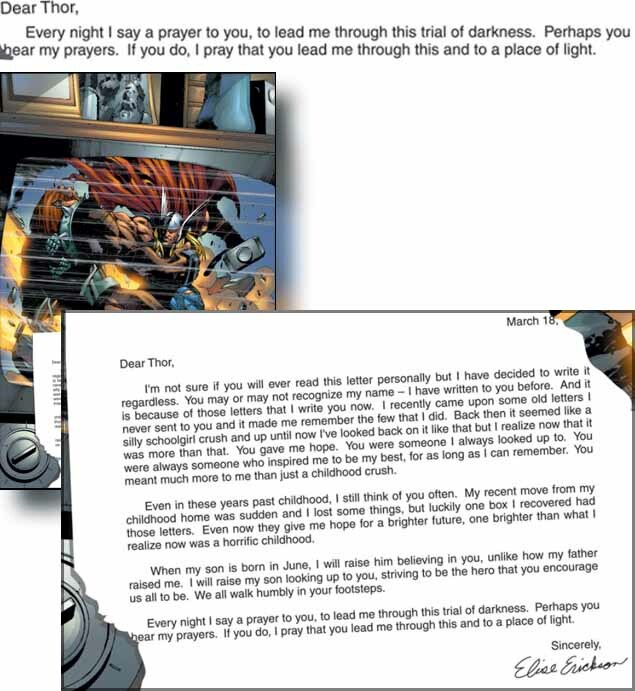 In her letter, the now-adult Elise alludes to a tormented childhood, but she tells Thor: "You gave me hope." Elise later states that finding some of the letters she wrote as a child "give [her] hope for a brighter future. Elise promises Thor that she will raise her own son "believing in" him. BELOW: Thor explicitly refers to himself as the "God of Thunder" in response to the Hulk's impious banter: The Hulk was one of the founding members of the Avengers, but his time with the team was shot-lived. 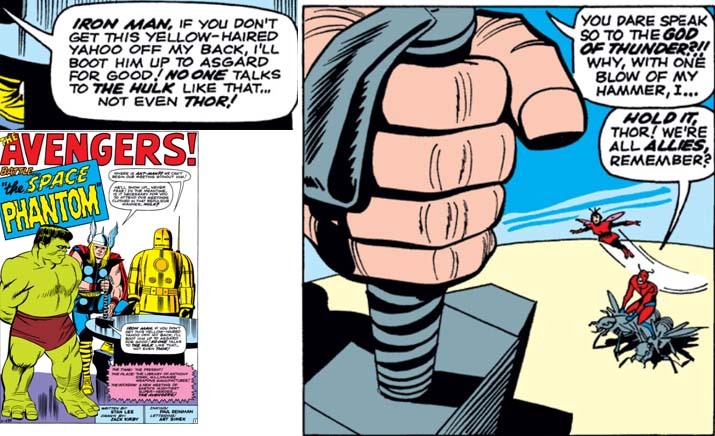 The friction between the Hulk and his teammates is evident in this Avengers meeting when the the Hulk calls Thor a "yellow-haired yahoo" and threatens to "boot him up to Asgard for good!" Thor, demonstrating his genuinely godly self-identity, responds: "You dare speak so to the God of Thunder?!! Why, with one blow of my hammer, I--"
BELOW: More than mere words: Thor's status as the "God of Thunder" causes the Space Phantom's power to backfire: For the third time in this issue, Thor refers to himself as the "God of Thunder." Here is a demonstration of the fact that this isn't mere braggadocio. Thor's divine nature actually causes the Space Phantom's alien abilities (which are presumably scientifically-based) to backfire. 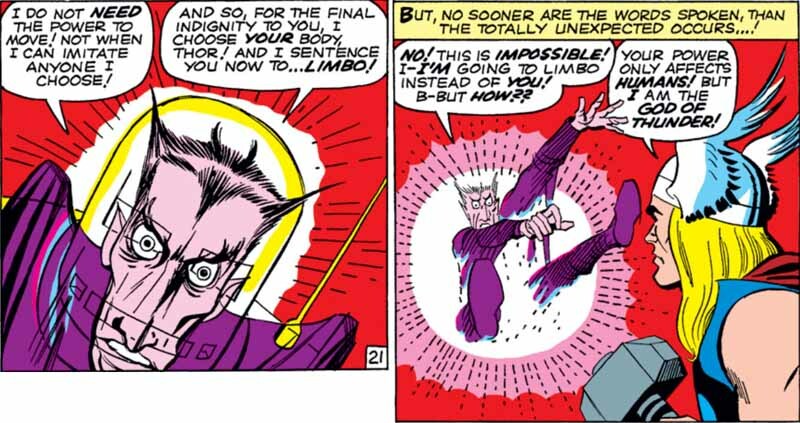 Instead of sending Thor to Limbo, the Space Phantom is himself forced into Limbo. Thor tells the Phantom, "Your power only affects humans!" Of course, we have already seen the Space Phantom's power affect insects and meta-humans (such as the Hulk). 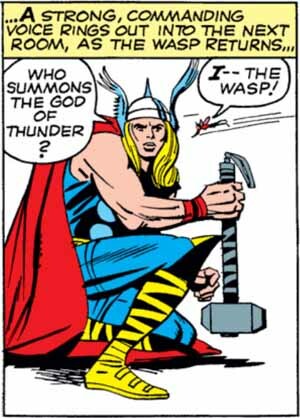 But apparently the Space Phantom's power doesn't work on a powerful divine Asgardian deity such as Thor. Thor actually did a double take. Steve thought that as long as he might live, he would never see anything quite so strange as a Norse god doing a double take . . . if, that is, he was going along with the proposition that Thor was a Norse god. "Wha . . . ?" Tony's eyes rolled in Nick's direction... "Everyone?" "Yeah," Nick said. "Thor got them out." ..."That crazy son of a b----. He did, huh?" Nick nodded. "Yeah, he did." "Good for him... I'm going to quit this robot suit business and become a Norse god," Tony said through the chattering of his teeth. BELOW: Hawkeye consesses to Thor that he pelted Loki (in disguise as a SHIELD technician present at an Ultimates team meeting) with super-accurately thrown straightened paper clips. Note Hawkeye's explicit reference to Loki as a Norse god. ...and Thor wondered what had really happened. Clint winked at him. "Can't stand a sneak," he whispered. "Especially a sneaky Norse god. I mean, if you're a Norse god, show yourself." Clint held up a paper clip, bent straight except for a single curl at one end. He made a flicking motion with the fingers of his right hand. "Sent him a little greeting card, is all." What would he have told Rogers? That Loki had taken a special interest in him? Rogers believed in flag and country, nothing else. His was a pure belief, not ignorant of nuance but dismissive of it, deeply invested in a black-and-white view of the world. There was an innocence about it that gave Rogers much of his strength, but that innocence was also part of what made him a useful tool for those who operated by deceit. Strength of belief, Thor thought, was admirable, but it was a lever that when used against you always tipped you long before you knew it was being used. And so, Thor thought. I have come looking for him to call him a naif and tell him that my half brother, another god he doesn't believe in, has a plan for him. Hardly an errand with good prospects of success. To know, and not be believed. This was the lot of the gods. All the same, Thor was glad he wasn't a mortal. Fate would do what Fate did, to Steve Rogers and to them all. 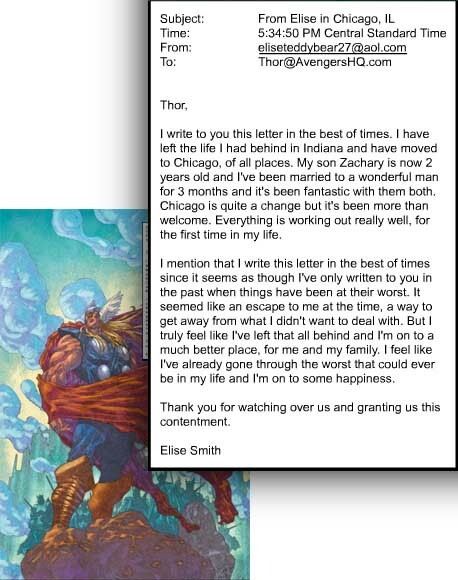 BELOW: Elise Erickson writes to Thor, who she humbly worships: "Thank you for watching over us and granting us this contentment. ": Elise Erickson's feelings about Thor as a genuine religious deity are further illustrated by this letter that she wrote to him. She notes the good things that have happened in her life recently - moving away from her dysfunctional family, her marriage to a "wonderful man" and generally having a good life with her husband and son. She thanks Thor for watching over her family and for "granting" her and her family "this contentment." This goes beyond simple appreciation to a super-hero for specific acts of heroism. Elise's sentiments are analogous to a prayer of gratitude a person might say, thanking God or Jesus for the blessings in their life. BELOW: Thor feels that Nick Fury is going to great lengths to rationalize rather than accept the facts of Thor's and Loki's existence. Thor gently chides Nick Fury for his inability to believe that Thor is a god and that Loki has just appeared before them in the form of somebody else. Nick Fury's secular mindset simply can't allow for such possibilities. Thor tells Fury: "I know what I know." 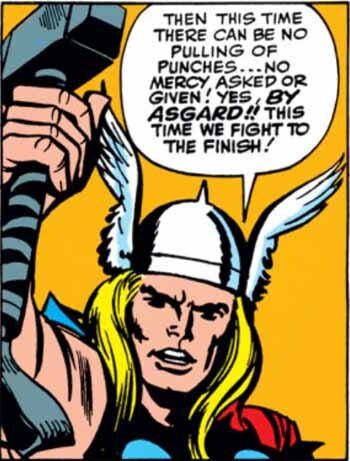 Fury's disbelief will not dissuade Thor from his convictions. "And you," Fury went on, now pointing to Thor, "are one crazy son of a bi---." Thor spread his hands. "General. After all we've seen in this past year, you still think it's crazy to believe in shapeshifters?" Fury glared daggers at him. "And the truth is, I don't care about what you think where my mental stability is concerned. I know what I know. However you want to rationalize it to yourself is fine." "Oh," Fury said. "You're going to lecture me about rationalizing? Let me get out my tape recorder." "General Fury," Thor said. "That was Loki... If you need to think I'm crazy because that's the way your world makes sense to you, be my guest," Thor said. "But this happened. And what needs to happen now is..."
What Steve couldn't figure out was why Thor was along .He couldn't imagine that General Fury had decided to trust an obviously crazy pinko with something as serious as the details of a new Chitauri incursion. Regardless of what Thor had done with the Chitauri bomb in Arizona, Steve didn't for a minute believe in a thunder god. Either the bomb hadn't done what the Chitauri said it would, or the tech in Thor's hammer had some secret functions that he hadn't told any of them about. 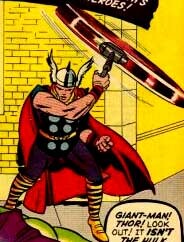 Whichever it was, Thor was a loose cannon and a security risk. If it was up to Steve, Thor wouldn't have been let within a mile of the Triskelion. Thor took a deep breath, letting the smells of the land and the battle flood through him. As he exhaled, he said, "Here amid icebergs rule I the nations." "Oh, God," Tony groaned. "Are we quoting eddas today?" Thor shot him a grin. "No, that's Longfellow. He was a big fan of mine. Gotcha." And then he raised Mjolnir and leapt down again, blood singing with the battle to come. ...At times like these, Thor thought, I would just as soon fly, and to hell with this pretense for mortals and their small fears. He felt the absence of Mjolnir in his hands... Being immortal had its privileges . . . and its drawbacks, Thor thought, remembering the dark and shining malice on the face of his half brother. Steve Rogers is my favorite, Loki had said. That much Thor had told Fury. What he had not mentioned was Loki had said something else. Rogers I love, Loki had said, because he will squeeze so hard with his fists of order that chaos will inevitably squirt out. And laughed, Loki had, long and loud. Thor picked up the pace, spurred on by a sense he couldn't shake that something was about to happen, some trick about to be played on a man whose goodness would be the lever that evil would use against him. To be a god was to know things; the joke of fate was that too often, what even the gods knew was not quite enough. BELOW: Thor invokes Asgard: In an utterance which seems as though it might be the equivalent of "By God" for an American, the Norse god Thor invokes his homeland, Asgard. Asgard is the mystic realm of the Norse/Teutonic pantheon of deities. "Okay," Fury said. "Let' say I believe you. How do you suggest I explain to the congressional inquiry that I knew I had to do it because of the word of the Norse thunder god?" Thor put away his smile. "Is that the worst problem you can think of?" "All except for the part about the amplifier being fake," Thor said. Clint looked from Thor to Tony to Nick, and then back to Thor. "What?" "Sure. Ask him. There is no amplifier. He showed it to us, then put out a distress call to get us to come save it. Only . . . what's the best way to put it, Tony? Would you call it instilling brand loyalty?" "Oh, for Christ's sake," Tony said. "You and your hippie canards. It worked, didn't it? And aren't you the one who called down lightning in the middle of my headquarters, with my employees all over the place? You can shove your sanctimony, too." BELOW: Thor calls Hank Pym's scientific achievement "miraculous": There is a certain irony in this scene. 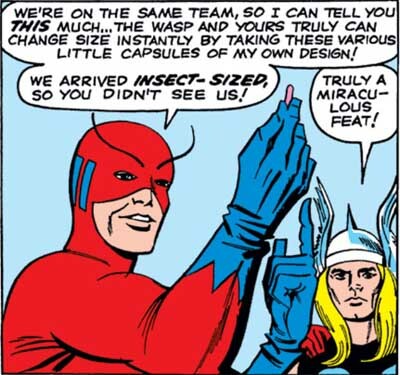 Thor, who is an actual deity, the Norse god of thunder, sees Hank Pym (Ant-Man) and Janet Van Dyne (the Wasp) change from insect-sized to human-sized, and then hears Dr. Pym explain his invention - the pills that allow them to change size. Thor calls this scientific achievement "miraculous." This could be viewed as an interesting inversion of the standard use of this word, in which a scientifically unexplainable and presumably divinely-caused event is referred to as "miraculous" or a "miracle." Perhaps I understand Steve Rogers a little better than most, because he is lost in time as well. But he is also a creature of duty and obedience, and I understand only the first of those. In obedience I have not the slightest interest. A Moment of Silence #1 (Feb. 2002): "Thor and Fireman"
The Amazing Spider-Man Annual #16 (Dec. 1982): "Who's That Lady?" The Amazing Spider-Man Annual 2000 (May 2000): "Fast Lane, Part 4 of 4: Back on Target"
The Amazing Spider-Man Annual '97 (June 1997): "...Before the Dawn"
The Avengers (vol. 1) #1 (Sep. 1963): "The Coming of the Avengers!" The Avengers (vol. 1) #1.5 (Dec. 1999): "The Death-Trap of Doctor Doom!" The Avengers (vol. 1) #2 (Nov. 1963): "The Avengers Battle... the Space Phantom"
The Avengers (vol. 1) #3 (Jan. 1964): "The Avengers Meet... Sub-Mariner!" The Avengers (vol. 1) #4 (Mar. 1964): "Captain America Joins...The Avengers!" The Avengers (vol. 1) #6 (July 1964): "Masters of Evil!" The Avengers (vol. 1) #7 (Aug. 1964): "Their Darkest Hour!" The Avengers (vol. 1) #8 (Sep. 1964): "Kang, the Conqueror!" The Avengers (vol. 1) #9 (Oct. 1964): "The Coming of the... Wonder Man!" The Avengers (vol. 1) #11 (Dec. 1964): "The Mighty Avengers Meet Spider-Man!" The Avengers (vol. 1) #12 (Jan. 1965): "This Hostage Earth!" The Avengers (vol. 1) #13 (Feb. 1965): "Trapped in... The Castle of Count Nefaria!" The Avengers (vol. 1) #14 (Mar. 1965): "Even Avengers Can Die!" The Avengers (vol. 1) #15 (Apr. 1965): "Now, By My Hand, Shall Die a Villain!" The Avengers (vol. 1) #66 (July 1969): "Betrayal!" The Avengers (vol. 1) #68 (Sep. 1969): "...And We Battle for the Earth!" The Avengers (vol. 1) #69 (Oct. 1969): "Let the Game Begin"
The Avengers (vol. 1) #70 (Nov. 1969): "When Strikes the Squadron Sinister!" The Avengers (vol. 1) #71 (Dec. 1969): "Endgame!" The Avengers (vol. 1) #86 (Mar. 1971): "Brain-Child to the Dark Tower Came"
The Avengers (vol. 1) #87 (Apr. 1971): "Look Homeward, Avenger!" The Avengers (vol. 1) #94 (Dec. 1971): "More Than Inhuman!" The Avengers (vol. 1) #100 (June 1972): "Whatever Gods There Be!" The Avengers (vol. 1) #101 (July 1972): "Five Dooms to Save Tomorrow!" The Avengers (vol. 1) #109 (Mar. 1973): "The Measure of a Man!" The Avengers (vol. 1) #112 (June 1973): "The Lion God Lives!" The Avengers (vol. 1) #115 (Sep. 1973): "Below Us the Battle!" The Avengers (vol. 1) #120 (Feb. 1974): "Death-Stars of the Zodiac!" The Avengers (vol. 1) #123 (May 1974): "Vengeance in Viet Nam!" The Avengers (vol. 1) #124 (June 1974): "Beware the Star-Stalker!" The Avengers (vol. 1) #126 (Aug. 1974): "All the Sounds and Sights of Death!" The Avengers (vol. 1) #145 (Mar. 1976): "The Taking of the Avengers!" The Avengers (vol. 1) #162 (Aug. 1977): "The Bride of Ultron!" The Avengers (vol. 1) #166 (Dec. 1977): "Day of the Godslayer!" The Avengers (vol. 1) #167 (Jan. 1978): "Tomorrow Dies Today!" The Avengers (vol. 1) #171 (May 1978): "...Where Angels Fear to Tread"
The Avengers (vol. 1) #181 (Mar. 1979): "On the Matter of Heroes!" The Avengers (vol. 1) #189 (Nov. 1979): "Wings and Arrows!" The Avengers (vol. 1) #200 (Oct. 1980): "The Child Is Father To...?" The Avengers (vol. 1) #210 (Aug. 1981): "You Don't Need the Weathermen to Know Which Way the Wind Blows!" The Avengers (vol. 1) #212 (Oct. 1981): "Men of Deadly Pride!" The Avengers (vol. 1) #213 (Nov. 1981): "Court-Martial"
The Avengers (vol. 1) #225 (Nov. 1982): "The Fall of Avalon"
The Avengers (vol. 1) #233 (July 1983): "The Annihilation Gambit!" The Avengers (vol. 1) #235 (Sep. 1983): "Havoc on the Homefront!" The Avengers (vol. 1) #269 (July 1986): "The Once and Future Kang!" The Avengers (vol. 1) #280 (June 1987): "Faithful Servant"
The Avengers (vol. 1) #300 (Feb. 1989): "Inferno <sup>2</sup>"
The Avengers (vol. 1) #300 (Feb. 1989): "The Coming of the Accursed Avengers!" Avengers (vol. 1) #301 (Mar. 1989): "Super-Nova Unbound!" Avengers (vol. 1) #398 (May 1996): "Paranormal Activity"
Avengers (vol. 1) #402 (Sep. 1996): "End of the Line"
The Avengers (vol. 2) #1 (Nov. 1996): "Awaken the Thunder!" The Avengers (vol. 2) #13 (Nov. 1997): "World War, 3 Part 2: Winning and Losing"
The Avengers (vol. 3) #5 (June 1998): "Accusation Most Foul"
The Avengers (vol. 3) #6 (July 1998): "Earth's Mightiest Frauds?" The Avengers (vol. 3) #8 (Sep. 1998): "Turbulence!" The Avengers (vol. 3) #38 (Mar. 2001): "Above and Beyond"
The Avengers (vol. 3) #43 (Aug. 2001): "Global Presence"
The Avengers (vol. 3) #50 (Mar. 2002): "Book of Revelations"
The Avengers (vol. 3) #56 (Sep. 2002): "Lo, There Shall Come... an Accounting!" The Avengers (vol. 4) #1 (July 2010): "Next Avengers, Part 1"
The Avengers (vol. 4) #32 (Dec. 2012): "Inner Space"
Avengers (vol. 5) #1 (Feb. 2013): "Avengers World"
Avengers (vol. 5) #2 (Feb. 2013): "We Were Avengers"
The Avengers Annual #12 (1983): "Moonrise"
Avengers Annual #20 (June 1991): "Avengers Origin"
Avengers: A Marvel Treasury (1982): "The Avengers"
The Avengers: Celestial Quest #1 (Nov. 2001): "I Die Unknown!" The Avengers: Celestial Quest #2 (Dec. 2001): "Madonna Reborn!" The Avengers: Celestial Quest #3 (Jan. 2002): "What Goes Around..."
The Avengers: Celestial Quest #4 (Feb. 2002): "War!" The Avengers: Celestial Quest #5 (Mar. 2002): "Love!" The Avengers: Celestial Quest #6 (Apr. 2002): "The Chase!" The Avengers: Celestial Quest #7 (May 2002): "Doom!" The Avengers: Celestial Quest #8 (June 2002): "Death Itself!" Avengers: The Terminatrix Objective #2 (Oct. 1993): "On the Side of the Angels"
Avengers: The Terminatrix Objective #3 (Nov. 1993): "Day of Maximum Probability"
Avengers: The Terminatrix Objective #4 (Dec. 1993): "Thy Kangdom Come"
Avengers: The Ultron Imperative #1 (Nov. 2001): "The Ultron Imperative"
Captain America (vol. 1) #113 (May 1969): "The Strange Death of Captain America"
Captain America (vol. 1) #176 (Aug. 1974): "Captain America Must Die!" Captain America (vol. 1) #228 (Dec. 1978): "A Serpent Lurks Below"
Captain America (vol. 1) #229 (Jan. 1979): "Traitors All About Me!" Captain America (vol. 1) #252 (Dec. 1980): "The Life and Times of Captain America!" Captain America (vol. 1) #289 (Jan. 1984): "Tomorrow, the World?" Captain America (vol. 1) #366 (Jan. 1990): "Remote Control"
Captain America (vol. 1) #384 (Apr. 1991): "Lair of the Ice-Worm"
Captain America (vol. 1) #400 (May 1992): "Captain America Joins...The Avengers!" Captain America (vol. 1) #444 (Oct. 1995): "Hope and Glory"
Captain America (vol. 1) #449 (Mar. 1996): "First Sign, Chapter One: I'll Take Manhattan"
Captain America (vol. 3) #3 (Mar. 1998): "Museum Piece"
Captain America (vol. 3) #5 (May 1998): "Power and Glory, Chapter One: Credibility Gap"
Captain America (vol. 3) #6 (June 1998): "Power and Glory, Chapter Two: Expose"
Captain America (vol. 3) #7 (July 1998): "Power and Glory, Chapter Three: Hoaxed"
Captain America (vol. 3) #50 (Feb. 2002): "Stars & Stripes Forever"
Captain America 70th Anniversary Magazine #20 (Winter 2011): "Captain America Joins...The Avengers!" Captain America Special Edition #2 (Mar. 1984): "The Strange Death of Captain America"
Captain America: Man Out of Time #5 (May 2011): "Part 5"
Captain America: Who Won't Wield The Shield? #1 (June 2010): "The Incredibly Normal and Bourgeois Idea of Doctor America, Occult Operative of Liberty"
Contest of Champions II #1 (Sep. 1999): "The Gathering"
Contest of Champions II #3 (Oct. 1999): "Culling the Hero"
Daredevil (vol. 1) #30 (July 1967): "-- If There Should Be a Thunder God!" Daredevil (vol. 1) #99 (May 1973): "The Mark of Hawkeye!" Daredevil (vol. 1) #164 (May 1980): "Expos&eacute;"
Daredevil (vol. 1) #233 (Aug. 1986): "Armageddon"
Deadpool (vol. 4) #1 (Jan. 2013): "In Wade We Trust"
The Defenders (vol. 1) #9 (Oct. 1973): "Divide...and Conquer"
The Defenders (vol. 1) #10 (Nov. 1973): "Breakthrough!" The Defenders (vol. 1) #107 (May 1982): "On Death and Dying..."
The Defenders (vol. 1) #108 (June 1982): "The Wasteland"
The Defenders (vol. 1) #109 (July 1982): "Vengeance! Cries the Valkyrie"
Fantastic Four (vol. 1) #400 (May 1995): "In Memoriam!" Fantastic Four: Atlantis Rising #1 (June 1995): "--Atlantis Rising!" Fantastic Four: Atlantis Rising #2 (July 1995): "Assault on Atlantis"
Fantastic Four: The World's Greatest Comics Magazine! Fantastic Four: The World's Greatest Comics Magazine! #8 (Sep. 2001): "...To Aid the Avengers!" Fantastic Four: The World's Greatest Comics Magazine! #10 (Nov. 2001): "On... to Asgard!" Fantastic Four: The World's Greatest Comics Magazine! #11 (Dec. 2001): "Doom Triumphant!" Gambit (vol. 5) #9 (Apr. 2013): "A Man Walks into a Bar..."
Giant-Size Avengers (vol. 2) #1 (Feb. 2008): "Good Housekeeping"
Giant-Size Avengers (vol. 2) #1 (Feb. 2008): "Panegyrich"
Giant-Size Avengers (vol. 2) #1 (Feb. 2008): "Memorial Day"
Godwheel #0 (Jan. 1995): "The Heroes and Villains of Godwheel"
Godwheel #1 (Jan. 1995): "The Decision"
Hulk (vol. 3) #5 (Oct. 2008): "Rolling Thunder"
Hulk (vol. 3) #6 (Nov. 2008): "Blood Red"
Hulk Smash Avengers #1 (July 2012): "By Banner Betrayed!" Hulk Smash Avengers #3 (July 2012): "Once an Avenger..."
The Incredible Hulk Annual #16 (June 1990): "The Hulk's 10 Best Brawls"
The Incredible Hulk Annual #20 (July 1994): "You're Invited!" Iron Man & Captain America Annual 1998 (Dec. 1998): "Life & Liberty"
Iron Man (vol. 1) #39 (July 1971): "A Twist of Memory-- A Turn of Mind!" Iron Man (vol. 3) #22 (Nov. 1999): "The Thrill of the Chase!" Journey Into Mystery (vol. 1) #100 (Jan. 1964): "The Master Plan of Mr. Hyde!" Journey Into Mystery (vol. 1) #100 (Jan. 1964): "The Storm Giants"
Journey Into Mystery (vol. 1) #113 (Feb. 1965): "The Boyhood of Loki!" Journey Into Mystery (vol. 1) #115 (Apr. 1965): "A Viper in Our Midst!" Journey Into Mystery (vol. 1) #116 (May 1965): "The Challenge!" Journey Into Mystery (vol. 1) #117 (June 1965): "The Sword in the Scabbard!" Journey Into Mystery (vol. 1) #118 (July 1965): "The Crimson Hand"
Journey Into Mystery (vol. 1) #119 (Aug. 1965): "Gather, Warriors!" Journey Into Mystery (vol. 1) #120 (Sep. 1965): "Set Sail!" Marvel 1602 #7 (Apr. 2004): "Part Seven: In Which Many Patterns May Be Discerned, By Those with Eyes to See Them"
Marvel 1602 #8 (June 2004): "Part Eight: In which We Discover the Way of the World"
Marvel Double-Shot #2 (Feb. 2003): "The Roots of All Evil"
Marvel Fanfare (vol. 1) #8 (May 1983): "The Bill Sienkiewicz Portfolio!" Marvel Fanfare (vol. 1) #18 (Jan. 1985): "The Terry Austin Portfolio"
Marvel Fanfare (vol. 1) #20 (May 1985): "Vess Pocket Portfolio"
Marvel Fanfare (vol. 1) #22 (Sep. 1985): "Pin-Ups by Steacy"
Marvel Fanfare (vol. 1) #45 (Aug. 1989): "Thor; Loki"
Marvel Fanfare (vol. 1) #56 (Apr. 1991): "A Mike Vosburg Portfolio"
Marvel Fanfare (vol. 1) #56 (Apr. 1991): "Marvel Heroes"
Marvel Graphic Novel #17 (June 1985): "Revenge of the Living Monolith"
Marvel Holiday Special 2004 #1 (Jan. 2005): "Jonah's Holiday Carol"
Marvel Super-Heroes (vol. 1) #21 (July 1969): "The Avengers Meet... Sub-Mariner!" Marvel Super-Heroes Secret Wars #1 (May 1984): "The War Begins"
Marvel Super-Heroes Secret Wars #2 (June 1984): "Prisoners of War"
Marvel Super-Heroes Secret Wars #3 (July 1984): "Tempest Without, Crisis Within!" Marvel Super-Heroes Secret Wars #4 (Aug. 1984): "Situation: Hopeless!" Marvel Super-Heroes Secret Wars #5 (Sep. 1984): "The Battle of Four Armies!" Marvel Super-Heroes Secret Wars #6 (Oct. 1984): "A Little Death..."
Marvel Super-Heroes Secret Wars #7 (Nov. 1984): "Berserker!" Marvel Super-Heroes Secret Wars #8 (Dec. 1984): "Invasion!" Marvel Super-Heroes Secret Wars #9 (Jan. 1985): "Assault on Galactus!" Marvel Super-Heroes Secret Wars #10 (Feb. 1985): "Death to the Beyonder!" Marvel Super-Heroes Secret Wars #11 (Mar. 1985): "...And Dust to Dust!" Marvel Super-Heroes Secret Wars #12 (Apr. 1985): "...Nothing to Fear..."
Marvel Team-Up (vol. 1) #11 (July 1973): "The Doomsday Gambit!" Marvel Team-Up (vol. 1) #116 (Apr. 1982): "Between Sword and Hammer!" Marvel Universe: Millennial Visions #1 (Feb. 2002): "The Death of the Fearsome Four"
Marvel Universe: Millennial Visions #1 (Feb. 2002): "Assembled Once More"
Marvel Universe: Millennial Visions #1 (Feb. 2002): "Hammer Time"
Marvel: Heroes & Legends '97 (Oct. 1997): "Avembers Assemble!" Marvel: The Lost Generation #5 (Oct. 2000): "Wild in the Streets"
Nova (vol. 1) #4 (Dec. 1976): "Nova Against The Mighty Thor!" Peter Parker: Spider-Man (vol. 2) #11 (Nov. 1999): "An Exemplary Day!" The Rampaging Hulk (vol. 1) #8 (Apr. 1978): "Great Moments in Hulk History"
Red She-Hulk #59 (Jan. 2013): "Hell Hath No Fury: Part Two"
Red She-Hulk: Hell Hath No Fury (Apr. 2013): "Hell Hath No Fury: Part Two"
Secret Wars II #5 (Nov. 1985): "Despair!" Secret Wars II #6 (Dec. 1985): "Life Rules!" Secret Wars II #9 (Mar. 1986): "God in Man, Man in God!" Strange Tales (vol. 1) #178 (Feb. 1975): "Who Is Adam Warlock?" Strange Tales (vol. 5) #3 (Jan. 2000): "Let's Fight"
Super-Villain Team-Up #14 (Oct. 1977): "A World For the Winning!" Tales to Astonish (vol. 1) #59 (Sep. 1964): "Enter: The Hulk"
Thor (vol. 1) #239 (Sep. 1975): "Time Quake!" Thor (vol. 1) #600 (Apr. 2009): "The Boyhood of Loki!" Thor (vol. 1) #600 (Apr. 2009): "A Viper in Our Midst!" Thor (vol. 2) #63 (June 2003): "The Follower"
Thunderbolts (vol. 1) #0 (1998): "A Rare Night Off"
Thunderbolts (vol. 1) #11 (Feb. 1998): "The High Ground"
Thunderbolts (vol. 1) #12 (Mar. 2009): "Endgame"
Uncanny Avengers #1 (Dec. 2012): "New Union"
Untold Tales of Spider-Man Annual '97 (1997): "It's Always Darkest..."
What If? (vol. 1) #38 (Apr. 1983): "The Leaving"
X-Factor (vol. 1) #32 (Sep. 1988): "The Carbon Copy Avengers"
X-Factor Annual #4 (1989): "Inferno Aftermath"
The X-Men (vol. 1) #9 (Jan. 1965): "Enter, the Avengers!"